What is a Resin Bound Tree Pit? 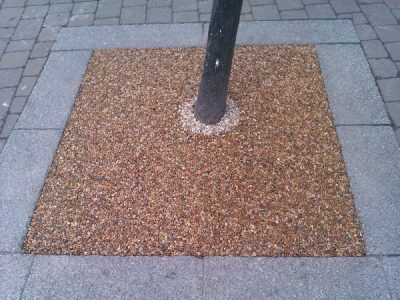 Much like the BoundWorx® Resin Bound system for external surfaces, a BoundWorx® Resin Bound Tree Pit is a mixture of resin and natural aggregate which is trowelled down around the base of trees where soil and roots are exposed. Tree pits use a larger sized aggregate compared to regular BoundWorx® materials. Rather than a blend of 1-3mm and 2-5mm stones, which tend to be used on driveways, paths and patios, the aggregate used for Resin Bound Tree Pits is 6-10mm. Another key difference is the installation depth of the materials. 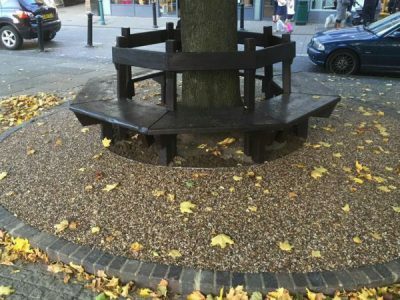 For Tree Pits in pedestrianised areas the recommended depth is 50mm. Whereas for areas that take occasional vehicle traffic, the recommended depth increases to 75mm. Why install a Resin Bound tree pit? Resin Bound Tree Pits offer a number of benefits. This includes their permeability which, along with the collared space around the trunk, means rainwater can drain through to the tree roots. Once you have successfully installed your Resin Bound Tree Pit you can fill the collar with loose gravel or bark mulch for a smart, professional finish. Aftercare for Tree Pits is relatively simple – they’re easy to clean and maintain. Installing a Tree Pit can help to reduce the risk of vandalism and litter entrapment. Moreover, our Tree Pit resin is fully UV stable so the colour won’t yellow over time when exposed to the elements. How is a tree pit installed? To install a tree pit, you need a 110v drill & paddle mixer for mixing the resin and hardener together, and – depending on the size of the units – you may also need a forced action mixer to combine the resin with the stone. The materials are then wheelbarrowed into place and trowelled by hand. The base needs to be clean, dry, compacted, urban tree soil under 50mm of compacted MOT Type 3. And, like the BoundWorx® Resin Bound system, there must also be a solid edging detail to lay up to. For areas where extra grip is required, scatter a fine glass grit into the surface before the materials have cured. If you require support with installing Resin Bound Tree Pits, you can enquire about our contractor training sessions here, or give us a call and speak to the technical team. Where can I get a Tree Pit? When looking for a Tree Pit, opt for a high quality product. This will ensure longevity and ease of installation. 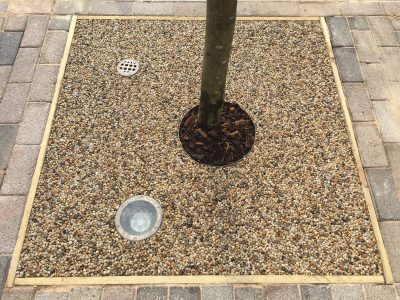 At Resin Bonded Ltd, our Resin Bound Tree Pits offer an environmentally friendly and practical solution. What’s more, our resins have been specially formulated to maximise user friendliness. Our Tree Pits are suitable for a variety of locations and sizes including places close to a heavy traffic flow.